This wine-growing property (appellation château) was a former convent, like some of the vineyards in the Bordeaux region. The vast building overlooks 45 hectares of vines, a lagoon, then the sea with a panoramic view of the Albères and the Canigou. The residence wing of nearly 600m² consists of a superb living-room, a vast kitchen, a TV lounge, 3 spacious en-suites and 2 immense leisure rooms. The central part, with a renovated volume of about 300m², comprises a fully equipped winery on the ground floor. The right-hand wing of about 600 m² is in its original state but has a new roof, and can be converted for all kinds of projects. Behind the venerable appearance lies practical modern comfort: floor heating/cooling system, alarm, electric shutters… but also a swimming-pool/pool house with sweeping and very peaceful views. 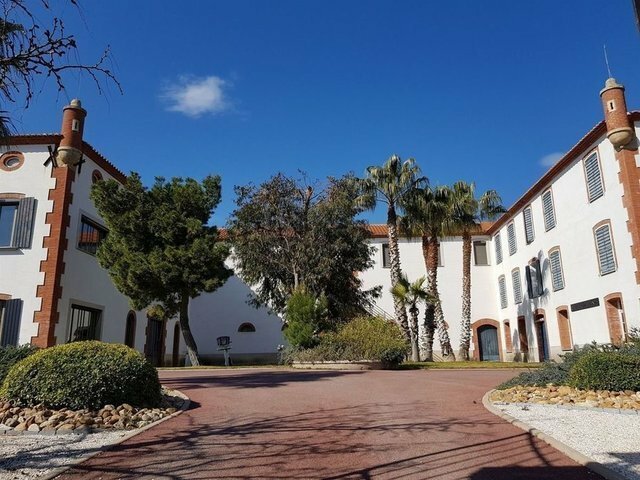 The building is sold with 2 hectares “for leisure”, but can also be sold with the whole 45 hectares of vineyards, with 9 varieties of grape, for 5 300 000 €.